Kitchen door replacement could be the solution for you. With replacement kitchen doors you don’t need to order a whole new kitchen, you keep your existing kitchen units and simply replace the doors and handles. At Riggzy Kitchens you can choose from 100s of colour and style combinations throughout our BA Door Ranges and you get the kitchen of your dreams at a fraction of the cost. 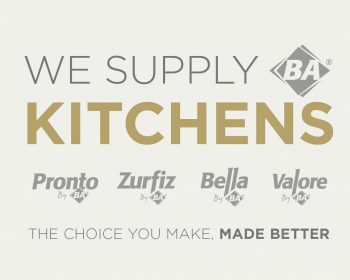 BA Kitchen door manufacturers design kitchen doors that complement and create space; using colour and textures to allow you to have the kitchen you’ve always wanted. Contemporary life or timeless classics, we’ve got it covered. So, whether you are planning just a door and drawer swap or a full kitchen installation we have the perfect doors for your taste and budget – visit our showroom to view all our samples.